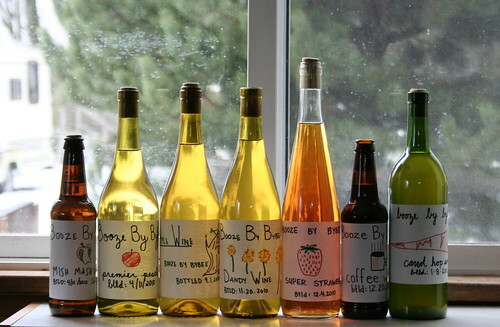 Do you remember that we make our own wine? I haven't posted about it in FOREVER. Really, no exaggeration. In case you are feeling confused at this moment, we started making our own wine a few years ago, beginning of 2010. You can read about how we make wine here. Our process is still about the same, only much more relaxed and unscheduled. We've been making wine fairly continuously, with a 4 monthish break around the time we moved and Scout was born. We usually make 1 gallon batches, although we just finished a 9.5 gallon batch and we did a 3-4 gallon batch this winter. We've been drinking our own wine consistently for quite some time, although we did have to supplement with our favorite store bought brand some this Winter. We plan to step up our brewing so that our supply and demand are in balance. From left to right. Dandelion, cherry, strawberry, coffee, and apple. Mish Mash Apple: This is the first wine we bottled! It was made from apples on all of the different trees in our old backyard. Andrew squeezed all of the apple chunks by hand. So tedious. We drank it chilled, and it was delicious! Tasted like a slightly fruity, white wine. Very nice and crisp and completely gone. Premier Peach: This was made from peaches we picked from the tree at our old house, it was another one of the first wines we made. We also drank this chilled, and it was wonderful! It is slightly sweeter than the apple, but not overly sugary. Very tasty, we drank it long ago. I would definitely make more of this if we came across peaches cheaply. Apple Wine: We made this wine from apple juice we bought at Haggen. This apple juice is made from local Gala Washington apples, has no preservatives and is amazing. We drank it chilled and it was light and fruity and very drinkable. It tasted very similar to the Mish Mash Apple wine, delicious and long gone. Dandy Wine: This wine was made from dandelions picked in our old backyard. Cheap, fun, and good. It turned out a pretty, pale yellow color. We drank it chilled and it had a very subtle flowerly flavor, not overly sweet at all. Tasted like summer, which sounds like heaven to me right now. We are planning on making quite a bit of this during the spring and summer months, our first batch is long gone. Super Strawberry: Made from strawberries we picked at Boxx Berry Farm, it turned out a light pink, a very pretty wine. We drank it chilled. It was a little sweet but a nice treat in small doses. Coffee Wine: My original review, "Made from locally roasted coffee beans and bottled in December, we are somewhat at a loss with this wine. When we first went to bottle it, it tasted terrible. So we went sweetened it, waited two weeks, and went to bottle it again. It was better, but not much. It has a very bitter first taste that Andrew says just slams you (I haven't tried it). We bottled it anyway and he is debating ways to make it into some sort of mixed drink or reflavor it make it palatable. Maybe it will be better when it ages? Any ideas?" and now my only additional thoughts are that it's pretty gross when you drink it straight. Probably our biggest flop. However, we did discover this winter that it mixes nicely with Hot Cocca or Egg Nog (or both). We still have some of this left. Carrot Hop Wine: We made this wine with carrots we picked from a local farm. Another wine that we drank chilled. I even liked the hoppy flavor, although I don't like beer. It definitely didn't taste like carrots, so don't worry! We also drank this wine chilled and it also is quite gone. Apple wine from the apples in our current home: We got our hands on a juicer, so making apple wine is much easier now. We just finished some a few months ago and the bottles are patiently aging. Apple cider from the apples in our current home: Finished fairly recently and it is already almost gone. Tasted like a cider but the alcohol content of a wine. Fizzy and bubbly and tasty. You don't have to let cider age like you do a wine, so even though this was made fairly recently, I think there is only one beer sized bottle left. Luckily we have another gallon almost ready to bottle, apple cider and wine will definitely be staples around here. Cherry Wine: Made from cherries we purchased and hauled back from Eastern Washington. This was AMAZING. I loved, loved, loved this wine. Most like a classic red wine, it had a very full flavor. We drank it a room temperature and often while snacking on chocolate chips. It is long gone, even though we tried to ration it. I wish cherries weren't so dang expensive or we'd be making this more frequently. Blueberry Wine: One of the wines that we started in our old house, and it sat around during our transition period. But it turned out delicious. And dangerous. Very juice-like taste and way too easy to drink, but it has a high alcohol content. We drink it chilled. Fortunately, we made two gallons. We have quite a bit left and are trying to ration it with the hopes that it will only get better with time. Green Grape Wine: I mentioned here that some friends of ours had grapes, and we had wine making equipment, so we combined our forces and made 9 and half gallons of wine. Again we were stupid and hand pressed them all instead of using a juicer. You would think we would learn. Never again. We just bottled this wine a little over a week ago and the bottles are sitting and aging now. This wine was a little tart, but we sweetened it and I am hoping it will turn out nicely. I don't think it will be a favorite, but definitely drinkable. We will have a little over 4 gallons so it should last us quite a while! Blackberry Wine: We just started this wine, with berries that we froze from last summer. We haven't even racked it yet. But it smells amazing. Cherry or blueberry level of amazing. Definitely going to pick more berries so we can make this a regular. Pear Wine: This was the other wine that we started in our old house, with pears we came into cheaply, and then we got busy and it sat for a while. It is delicious, but nothing amazing. But maybe I'm just meanly comparing it to the blueberry wine that we finished at the same time. We still have quite a bit of this in our rotation. Green Tomato Wine: This and the coffee wine are probably the only two I would call a flop. This turned out a pale, pale green and is best chilled. It has ginger in it, which I think is the part that bothers me. One glass is pretty good, but if you drink very much at all it starts to leave a weird burn in the back of your throat. Drinkable, just in really small amounts. We still have some of this left, even though it was made quite a while ago.